Traditionally the fight against discrimination has prioritised one group over another, e.g. working class rights, women’s rights, fighting racism, disableism, homophobia and so on. This often results in divide and rule. Setting one group against another, fighting for resources, etc. 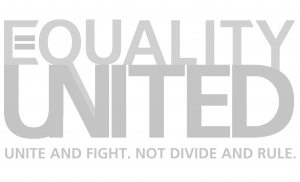 Equality United is a new approach to tackling inequality. Imagine how successful we might be if we all worked together to identify and challenge the underlying causes of oppression and work towards effective change and true equality for all. To work together to tackle the way institutions work to oppress and ignore the needs of some groups and communities whilst privileging others? To understand that many of us belong to several… oppressed groups (intersectionality) as well as some privileged ones. To unpick and discard the harmful messages we have internalised and release our true potential? We are talking about roughly 80% of the population! Now that is a powerful thought. There is something of a revolution happening in this country at the moment sparked by the election of Jeremy Corbyn as leader of the Labour Party. This movement of the people is an ideal opportunity to make Equality United a reality and challenge the inequality of the society we live in. Equality United will be launched at the Orange Box in Halifax on Sunday, 11th December 2016, 1-4 p.m. and will include the first of a series of interactive programmes to help make Equality United a reality. Come and join us. It is free to young people and low waged but we ask others to pay £5 towards the cost of the event.